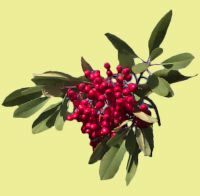 Toyon is an evergreen shrub or small tree growing 6 to 10 feet high and forming a round crown. The elliptical leaves are 2 to 4 inches long, dark green above and lighter underneath. The borders of the leaves are finely toothed. Small white flowers in terminal clusters appear in June and July. By Christmas, there are attractive red berries to add a cheerful note to the winter landscape and to provide a feast for robins, mockingbirds and cedar waxwings. Toyon berries were gathered by many Indian tribes. The berries were roasted over open coals or boiled in a cooking basket to take away the bitter taste of the fresh fruit. Indians also made a tea from the bark to cure stomach aches. Today, this beautiful and useful shrub is planted extensively in parks and gardens. It is found naturally in the foothills and on the bluffs along the American River Parkway.